Halloween is almost upon us again so it's time to start decorating. 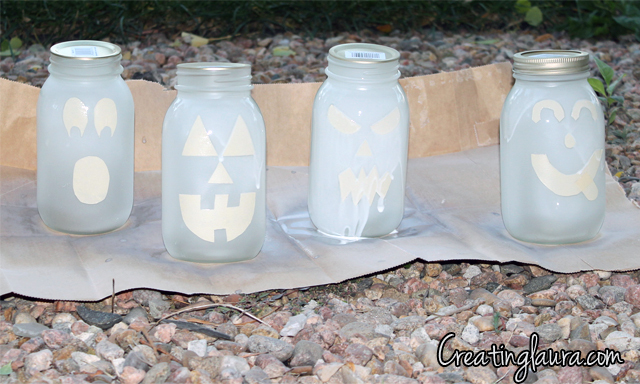 This summer, I spray painted bottles to make vases, and this week I thought it might be fun to use a similar technique on mason jars to make Jack-O'-Lanterns. I'm so glad I gave it a try because they turned out to be something I can't wait to put out on the front porch! 1. 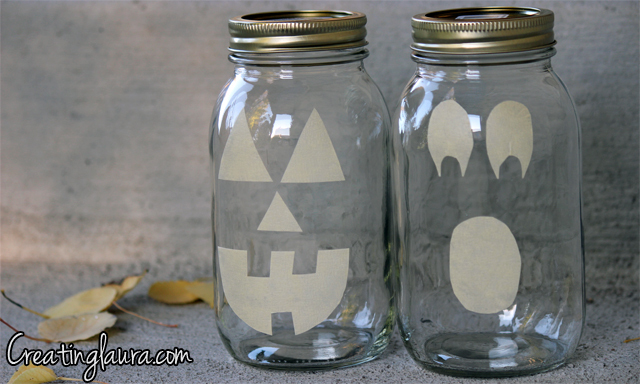 Mason jars that have at least one smooth side for the Jack-O'-Lantern faces to go on. 1. 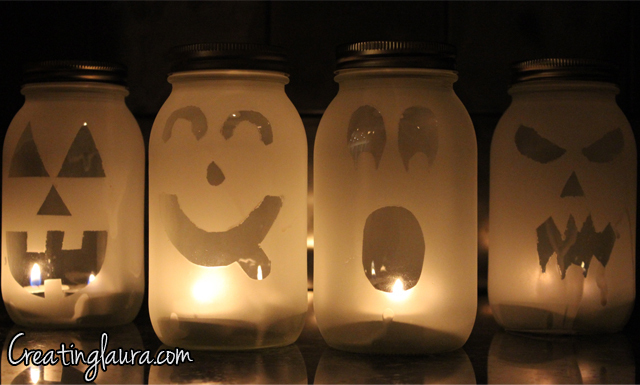 Cut shapes out of masking tape and arrange them on the mason jars to make cute/scary/funny faces on the jars. 2. 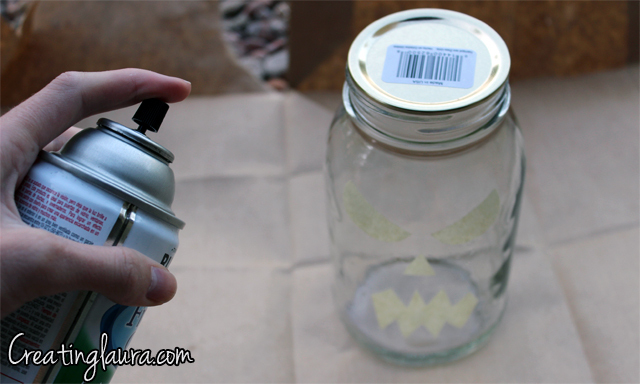 Spray paint the jars (outside in the fresh air, and on top of something disposable like the paper bag I used). 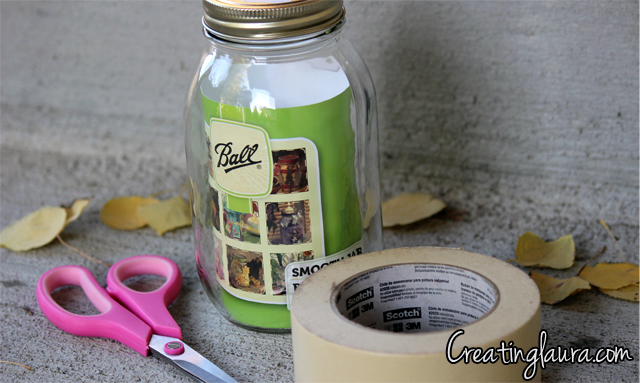 It's best to do several thin coats so that the paint doesn't form drips on the jar. If drips do form, however, don't sweat it. I accidentally had some drips on my scary-faced jar and I ended up loving them because they made the face look even scarier. 4. 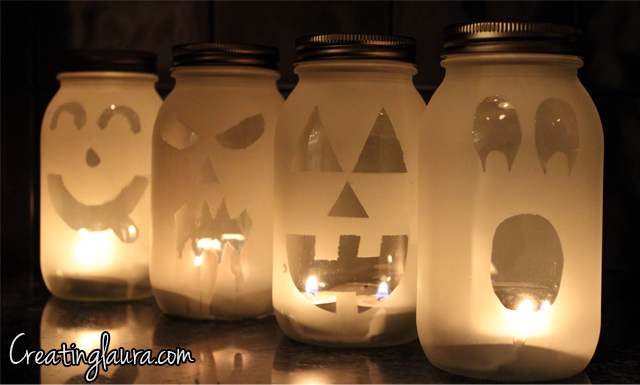 Peel off the tape faces and drop tea light candles inside the jars. I used large jars, so 3 tea lights fit into each of my jars. 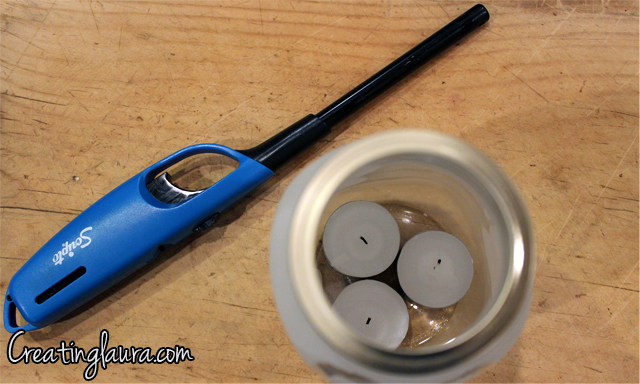 You're going to need a fire starter or a very long match to light the candles inside the jars. 5. If you have the kind of jars that have lids with removable centers, remove that center and screw the lid back on the jar after you light the candles. If you have solid lids, you'll need to poke holes in them so the candles have an oxygen source once they're lit and the lid is on. The hole-poking method will also provide a little more fire safety, so I recommend it even though it's a little more work. Let me know if you try this out, I'd love to see a picture! Love this idea!! I'm going to make these with my grandson! i luv it laura. when i have a glassjar and spray paint i will try doing it. I love this. I made them, but now wonder if I would be able to have them as glasses to drink from at a party. Very curious! !